WhatIsOrmus - What is Ionic Colloidal Silver? Ormus Benefits Home > Ormus Minerals Store > Ormus Minerals COLLOIDAL SILVER > What is Ionic Colloidal Silver? There is actually a lot of debate on the internet about particulate vs ionic silver. Some colloidal silver manufacturers claim that only "particulate" silver is truecolloidal silver and as such, always works best, while ionic silver is somehow its vastly inferior cousin. 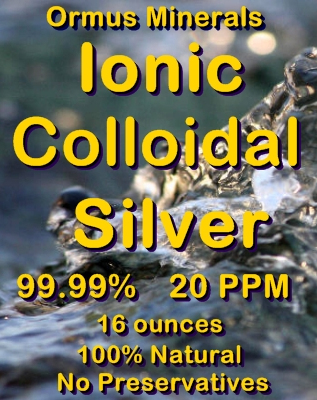 Ionic Silver is another step forward from Colloidal Silver. Lab Study Concludes: Ionic Silver is up to 10,000 times more effective. In reality, ionic silver solutions are not in the least bit inferior to particulate silver solutions. In fact, recent studies have shown quite the opposite. As you'll see on this link, ionic silver solutions have been demonstrated to be up to 10,000 times more effective against pathogensthan particulate silver solutions. The particle size is so small that nothing can be observed under an electron microscope! Ionic silver is a solution consisting of water andsingle atomsilver ions (dissolved silver) and containsno silver particles. Ionic silverisconductive and the electrical conductivity is directly related to the ionic concentration. The ions in solution remain dispersed due to mutual repulsion created by the ionic charge. When colloidal silver is stored over a period of time, the particles tend to agglomerate (clog) and build even larger clusters... which then reduces the amount amount of usefulsilver ions, thereby reducing the silver's effectiveness. According to experts, no microorganism ever tested has been able to stay alive for more than six minutes when exposed directly to colloidal silver! Dr. Harry Margraf, a biochemist and pioneering silver researcher who worked with the late Carl Moyer, M.D., chairman of Washington University's Department of Surgery in the 1970s:"Silver is the best all-around germ fighter we have." Science Digest cites colloidal silver as "...a wonder of modern medicine," and further states"Antibiotics kill perhaps a half dozen different disease organisms, but silver kills some 650. Resistant strains fail to develop.Moreover, silver is non-toxic. Colloidal silver, used as an anti-microbial agent, will not create super bugs as antibiotics do." Alfred Searle, founder of the giant Searle Pharmaceuticals (now Monsanto) stated,"Applying colloidal silver to human subjects has been done in a large number of cases with astonishingly successful results.For internal administration ... it has the advantage being rapidly fatal to pathogens without toxic action on its host. It is quite stable." Further information indicates that Colloidal Silver does not cause harmful interactions with other medications or topical treatments. In laboratory tests with colloidal silver, bacteria, viruses, and fungal organisms are killed within minutes of contact. Larry C. Ford, M.D. of the Department of Obstetrics and Gynecology, UCLA School of Medicine, Centre For The Health Sciences reported in November 1, 1988, " I tested them (the silver solutions) using standard anti-microbial tests for disinfectants. The silver solutions were anti-bacterial for concentrations of 105 organisms per ml of Streptococcus Pyogenes, Staphylococcus Aureus, Neisseria Gonorrhea, Gardnerella Vaginalis, Salmonella Typhi and other enteric pathogens, and fungicidal for Candida Albicans, Candida Globata and M. Furfur." Dr. Becker discovered that he had wiped out types of bacteria across the board, even those that were resistant to antibiotics." Regarding the innate ability of metallic silver to control infection, Dr. Becker said: "all of the organisms that we tested were sensitive to the electrically generated silver ion, including some that were resistant to all known antibiotics." On the safety of silver, he said,"in no case were any undesirable side effects of the silver treatment apparent." Dr. Bart Flickof Argentum Medical LLC, another early pioneer in silver medical research, invented FDA approved Silverlon wound contact dressing. "The antimicrobial activity of silver rests upon the interaction of silver with the bacteria's cellular membrane. This interaction can occur through the presence of asilver ionin solution or the release of silver in an ionic moiety directly from the surface of metallic silver when a bacterial cell membrane comes in direct contact with the metallic surface." Dr. Henry Crooks, author of Use of Colloids in Health Disease, found that silver in the colloidal state is highly germicidal, quite harmless to humans and absolutely non-toxic. From his bacteriological experiments with silver he concluded,"I know of no microbe that is not killed in laboratory experiments in six minutes." Dr. Bjorn Nordenstrom, of the Larolinska Institute, Sweden, has successfully used silver as a component in his cancer treatments for many years. Dr. Leonard Keene Hirschberg, A. M., M. D. (John Hopkins) states, "Speaking generally, the colloidal metals are especially remarkable for their beneficial action in infective states." Dr. Richard L. Davies, executive director of the Silver Institute, which monitors silver technology in 37 countries, reports:"In four years we've described 87 important new medical uses for silver.We're just beginning to see to what extent silver can relieve suffering." Peter Lindemann reports in his 1997 article,Colloidal Silver, A Closer Look,that a study conducted in part by the Institute of Microbiology in Rome, Italy and published inApplied and Environmental Microbiology(Dec. 1992), stated that "Pure electro-colloidal silver out- performed silver nitrate, silver chloride, and silver sulfadiazine as a broad spectrum germicide. For all classes of bacteria, fungus, and mold samples tested, pure electro-colloidal silver worked better, and at much lower concentrations. They concluded thatany additives reduced the effectiveness of the pure silver ion." According to Dr. Evan of Illinois, Kansas"We have had instant success with Colloidal Silver and immune compromised patients. A few examples are: Pink eye (topical) totally resolved in less than six hours; recurrent sinus infections (oral ingestion) resolved in eight days; acute cuticle infections resolved twenty four hours. Another major area in which we have improved our clinical results is in the area ofbowel detoxification and dysbiosis. The colloidal silver has provided excellent removal of abnormal intestinal bacteria also it has proved to be a great adjunct to our Candida albicans, Epstein Barr Virus and Chronic Fatigue Syndrome protocols. Ionic silver contains much smaller particles of silver than plain old colloidal silver. The idea is that it is absorbed into the bloodstream more readily. Ionic-colloidal silver has a higher ionic silver content, and a smaller percentage of (particulate) colloidal silver content. "Nanosilver has developed as a potent antibacterial, antifungal, anti-viral and anti-inflammatory agent. ... The targeting of cancer cells using silver nanoparticles has proven to be effective"
"Silver is a disinfectant for non-spore forming bacteria at concentrations about 1000 times lower than the levels at which it is toxic to mammalian life. ...The ionicform of silver is necessary"
"A mean reduction in bacterial counts of 95.8% was demonstrated"